Weeds are the most costly category of agricultural pests. Worldwide, weeds cause more yield loss and add more to farmers’ production costs than insect pests, crop pathogens, root-feeding nematodes, or warm-blooded pests (rodents, birds, deer, and other large grazers). Because organic farming principles and standards preclude the use of most herbicides, many organic farmers consider weeds their most serious barrier to successful organic production, and effective organic weed control a top research priority. In particular, weeds are a constant fact of life in vegetable crops. With a little diligence and timely weeding, the home gardener can turn most weeds into beneficial organic matter. However, weed control costs can really add up in a one-acre market garden, and a weedy vegetable field at the 10–100-acre scale can spell a crop failure. Having an ecological understanding of weeds is the foundation of an effective organic weed management program that can make the difference between success and failure. If it weren’t for weeds, the world would have lost more topsoil than it has to date, and humankind might have suffered mass starvation by now. Why? Because the plants we call weeds do a vital job in ecosystems: they quickly establish in, protect, and restore soil that has been left exposed by natural and human-caused disturbances. Watch any logged-over area in the Appalachian region of the eastern United States, and you will see precious topsoil washing away in each heavy rain—until the brambles (Rubus spp. ), greenbrier (Smilax spp. ), pokeweed (Phytolacca americana), poison ivy (Toxicodendron radicans), and other brushy weeds cover the ground with their impenetrable tangle. Other regions have their own characteristic guilds of pioneer plants that start the restoration process after timber harvest, natural disaster, or other disturbance has stripped the soil of vegetation. These pioneer plants initiate the process of ecological succession that, if left uninterrupted, will eventually restore the climax plant community native to the region: forest, savanna, prairie, chaparral, and so forth. In agriculture and horticulture, humans replace the native climax vegetation with a suite of domesticated plant species chosen for their value as food, fodder, fiber, and fuel. Most agricultural systems severely reduce the diversity of the plant community and impose some form of repeated disturbance designed to maintain conditions favorable to growth of the chosen crop species. This disturbance inevitably elicits a "weed response" from nature, especially in annual cropping systems such as vegetables, in which the soil is frequently tilled or otherwise prepared for planting. Successful organic weed control—managing the land’s natural weed response to cultivation—begins with an ecological understanding of weeds and their roles in the farm or garden ecosystem (Altieri, 1995; Sullivan, 2003). The word “weed” has been defined as a plant out of place, an unwanted plant, or a plant that is a pest in that it interferes with crop or livestock production. The term is typically applied to any plant species that often becomes a pest, such as common lambsquarters (Chenopodium album), pigweeds (Amaranthus spp. ), and crabgrasses (Digitaria spp.). However, weed manuals and herbicide promotional literature also list as weeds species such as clovers (Trifolium spp. ), orchardgrass (Dactylis glomerata), tall fescue (Festuca arundinacea), hairy vetch (Vicia villosa), and Jerusalem artichoke (Helianthus tuberosus)—plants that many farmers value as forage, cover, or food crops when grown in the right context. Indeed, “volunteer crops” such as buckwheat (Fagopyrum esculentum), winter rye (Secale cereale), corn (Zea mays), or even forage soybeans (Glycine max) can become weeds when they self-seed and emerge in another part of the crop rotation when they are no longer wanted. From these examples, it becomes apparent that the term “weed” is, in part, a human value judgment of certain plants or plant species as interfering with the desired use of a particular field or tract of land at a particular time. Even alfalfa (Medicago sativa), one of the most highly valued forage or hay crops, can be a weed in a vegetable garden. Weeds are evidence of nature struggling to bring about ecological succession. When we clear native vegetation and establish annual crops, we are holding back natural plant succession, at great cost in weed control.... Modern crop agriculture is typified by large acreages of a single plant type, accompanied by a high percentage of bare ground—the ideal environment for annual weeds to prosper in the first stage of succession. Holding succession at bay in these unstable agroecosystems can be managed only with big investments in cultivation, mowing, herbicides, and fertilizers. In addition, exotic plant species can create unexpectedly severe weed problems when these plants grow amok in new habitats in the absence of their natural checks and balances. In practice, any vegetation that comes up in a garden or field that the grower did not plant is often collectively called “weeds,” whether or not it is causing a problem. However, trying to eradicate all volunteer vegetation is hard on farm budgets, gardeners’ backs, soils, agroecosystems, fuel supplies, and the wider environment. Managing a weed species to protect the desired crops usually does not require exterminating that weed altogether. Based on these considerations, a weed might be defined as any plant not intentionally sown or propagated by the grower that requires management to prevent it from interfering with crop or livestock production. In this definition, a weed is a non-crop plant that can become a pest if not managed adequately. However its presence may not always be harmful and does not automatically warrant its immediate eradication. Weeds can perform vital ecosystem services such as protecting and restoring exposed or degraded soils. In addition, some weeds provide habitat for beneficial organisms, and thereby contribute significantly to natural and biological control of some insect pests. 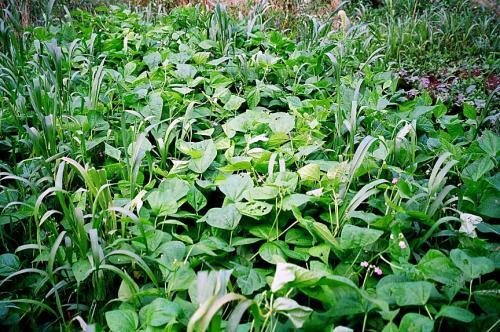 Certain weeds also make nutritious food or fodder. For example, a flush of common lambsquarters coming up in a fallow bed in late spring can take up nutrients that would otherwise leach, protect the soil surface from crusting and erosion, and provide highly nutritious greens for human or livestock consumption. Wild carrot (Daucus carota) flowering in field margins provides nectar and pollen for the adult phases of important natural enemies of vegetable pests. On the other hand, both lambsquarters and wild carrot can seriously interfere with vegetable production if they emerge in force with the crop, and allowing them to set seed in the field will intensify weed competition against future crops. Thus, managing weedy species like lambsquarters and wild carrot can consist of letting them grow and utilizing them when and where their presence is mainly beneficial; removing them promptly when they threaten to interfere with the crop; and mowing or pulling before they can cast seed onto crop fields. The goal of sustainable organic weed management is to minimize the adverse impacts of weeds on crops, and sometimes to reap the benefits of volunteer vegetation when the benefits outweigh the costs of allowing it to remain. It is important to understand that this flush of weed growth is, in effect, a healing response to land disturbance after either natural disaster or human activity leaves the soil vulnerable to erosion or degradation. Figure 1. This dense stand of weeds has "stolen" considerable soil moisture and nutrients from the onion crop, leading to a substantial yield loss. Figure credit: Mark Schonbeck, Virginia Association for Biological Farming. Figure 2. This hedge bindweed (Calystegia sepium) emerging in sweet corn not only competes for light, nutrients, and moisture, but is physically hindering normal crop development by binding leaves together. Figure credit: Mark Schonbeck, Virginia Association for Biological Farming. Figure 3. This giant foxtail (Setaria faberi) has not yet seriously affected the snap beans (now flowering and setting pods), but it can interfere with manual or mechanical harvest, and it may promote fungal diseases by limiting air flow through the bean crop. Figure credit: Mark Schonbeck, Virginia Association for Biological Farming. Figure 4. This tomato crop has lost its lower leaves to fungal diseases. 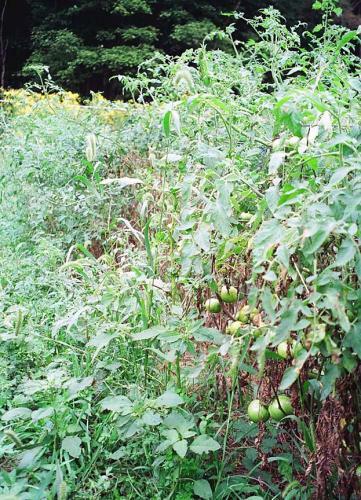 The weeds growing adjacent to the crop row have likely prolonged leaf wetness from morning dew, thus providing a more favorable environment for fungal growth on the tomato foliage. Figure credit: Mark Schonbeck, Virginia Association for Biological Farming. Cultivating land for annual crop production leaves the soil surface exposed for parts of the season, and thereby creates empty ecological niches. Open niches (bare, unoccupied soil; unutilized moisture and nutrients) may occur in time (between harvest of one crop and establishment of the next) (Fig. 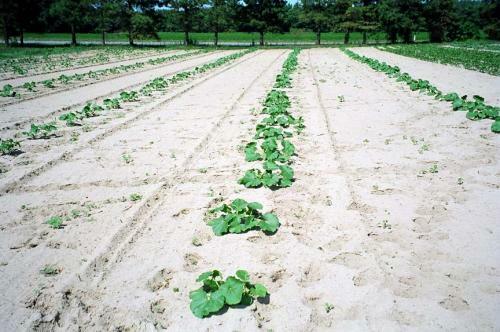 5) and in space (between rows or beds until the crop has closed canopy) (Fig. 6), or among sparsely-growing crop plants like onion family (Allium spp.) vegetables. Weeds emerge, grow, and reproduce in these open niches—until they are stopped by cultivation, pulling, mowing, herbicides, or direct competition from crops. Figure 5. This newly-tilled field is wide open for colonization by weeds. Figure credit: Mark Schonbeck, Virginia Association for Biological Farming. Figure 6. A substantial niche (space) remains between these widely spaced crop rows for weeds to emerge. Figure credit: Mark Schonbeck, Virginia Association for Biological Farming. In this time of growing awareness of the role of human-caused global climate change related to rising atmospheric carbon dioxide concentrations, farmers and agricultural professionals are beginning to talk about carbon sequestration as an added benefit of sustainable and organic farming. Fossil fuel burning is the most widely-understood source of excess carbon dioxide in the air. Less well known are the contributions of deforestation and net losses of soil organic matter to the annual carbon dioxide burden. All living vegetation, including weeds, absorbs carbon dioxide from the air and converts it into plant tissue. When the plant dies or sheds its leaves, part of this fixed carbon is returned to the atmosphere as carbon dioxide during decay, while part remains behind in the soil as stabilized organic matter, from which additional carbon dioxide is released only slowly. Farming systems that cause a net decrease in soil organic matter also entail a net release of carbon dioxide, whereas systems that achieve a net increase in soil organic matter sequester carbon into the soil. What does this have to do with weed management? To begin with, a field of bare soil almost always suffers a net loss in organic matter and releases carbon dioxide, whereas a field covered with crops and/or weeds takes up carbon dioxide. Every tillage operation stimulates some degree of organic matter oxidation and carbon dioxide release. The less bare soil in the crop rotation, and the less tillage used for weed control, the less carbon dioxide the farm adds to the air. Weed-preventive measures that increase crop cover and build soil organic matter are beneficial to the global carbon balance. Research has shown that, with best weed and soil management practices, organic and sustainable farms can make a net contribution toward addressing the global climate crisis. Cover crops are especially effective in sequestering carbon. Fast-growing summer annuals like pearl millet, sorghum–sudangrass, forage soybean, and sunnhemp can generate two to four tons per acre of biomass over a two to three month growth cycle (Schonbeck, 2006; Clark, 2007). Since plant biomass is about 40–45% carbon (dry-weight basis), the growth of one acre of these cover crops can remove 25–35 lb carbon (or 90–130 lb carbon dioxide) from the atmosphere per day. This rivals or exceeds the carbon uptake of solid stands of the most aggressive weeds, and of course the cover crop is far easier to manage! Such a cover crop can also “pay for” the carbon dioxide released by mechanized seedbed preparation, planting, and management within a few days. Growing a grass–legume cover crop biculture to maturity (flowering/heading) maximizes the humus formed when the cover crop is returned to the soil, and thus confers the greatest potential net sequestration. 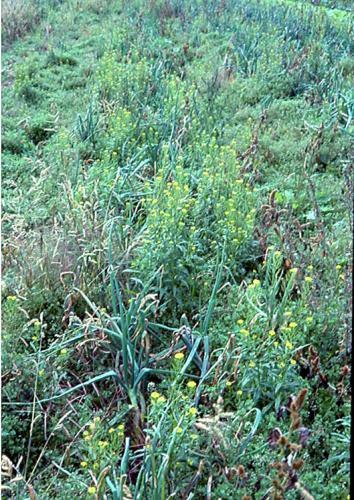 The more a cropping system differs from a region’s native vegetation, the less diverse the cultivated crop community, and the less it keeps the soil surface covered throughout the year, the more it provides open niches for weeds and the greater the effort required for successful weed control (Sullivan, 2003). Thus, in the eastern United States, where natural plant communities consist of mixed hardwood forest, even the best managed vegetable field will have more weeds than a mature orchard with a grass–forbs understory. In the Midwest, a perennial grass–legume pasture or hayfield with several forage species mixed together will likely have fewer weeds than a corn–soybean rotation. Permaculture, an alternative food production system that aims to mimic local natural plant communities and ecological processes, strives to keep all available niches occupied by useful vegetation year round, thus leaving minimal space for troublesome weeds (Mollison, 1988). Permaculture emphasizes the use of perennial food-producing crops, such as fruit- and nut-bearing trees and shrubs, with desired annual vegetables intercropped with perennials or grown in relatively small patches. Agroforestry, the practice of integrating tree crops (fruits, nuts, timber, wildlife habitat) with pasture or hayfields, simulates the savanna ecosystems of subhumid climates. Traditional food gardening systems in Mexico and other developing countries may include up to 75 useful plant species (including some that American farmers might call “weeds”) growing in multitiered plant communities of trees, shrubs, grasses, vegetables, and herbs that provide a wide diversity of foods, fodder, and even medicines, and leave little room for harmful weeds to grow. The permaculture approach may be impractical for farms whose main cash crops are annual vegetables that require a prepared seedbed to get established. However, the grower can close off some weed niches through preventive measures based on an ecological understanding of weed–crop interactions. A diverse crop rotation tends to grow fewer weeds than continuous corn or other monoculture. Cover crops, mulches, high density crop planting, reduced or strip till, intercropping, and relay cropping all reduce the “window of opportunity” for troublesome weeds (Yandoc et al., 2004). Two permaculture concepts that are relevant to annual cropping systems are multifunctional components (i.e., components that perform several functions at once), and the use of multiple tactics to accomplish a particular objective. Cover crops that protect and restore soil, harbor desirable insects, and suppress weeds are an example of a multifunctional component. Managing a problem weed with cover crops and livestock grazing as well as timely cultivation is an example of multiple tactics. Many of a region’s most problematic weeds are those that are not native to the region, or even the continent. These exotic plant species often grow more vigorously in their new habitat than they do in their area of origin, where certain soil organisms, herbivorous insects, climate patterns, and/or competing vegetation keep them in check. Kudzu (Pueraria thunbergiana), imported from Japan as a forage crop, is one dramatic example whose enormous vines can cover and kill large trees in the southeastern US. However, a small (4–18 inches) perennial weed called purple nutsedge (Cyperus rotundus), which has invaded the southern United States, causes much greater losses in cultivated crops (even sugarcane and coffee trees), and is considered the world’s worst weed (Holm et al., 1991). Some of our major agricultural weeds were intentionally brought to the United States from overseas to provide food or forage. European colonists carried common lambsquarters (Chenopodium album) to the New World as a vital source of early season greens that prevented scurvy and other nutritional deficiency conditions. Common lambsquarters has spread around the globe and is now listed as the world’s 10th worst agricultural weed. Livestock farmers imported bermudagrass (Cynodon dactylon, 2nd worst weed), johnsongrass (Sorghum halapense, 6th worst), and quackgrass (Elytrigia repens, a major weed of vegetable crops in the northeastern US) to this country for their utility as forages. Other serious exotic weeds were first planted as flowers and other ornamentals, and subsequently spread from cultivated gardens into surrounding farmland and/or natural ecosystems. Still others arrived by accident as a seed contaminant in imported crop seed, feed grain, foods, bedding plants, or other materials. Many exotic weeds have become “naturalized” over time, and are now part of a region’s agricultural weed flora that must be managed (not necessarily eradicated) to protect crop yields. However, some newly introduced plants growing in the absence of the natural enemies with which they evolved may spread unchecked, choking out native vegetation as well as invading pastures or cultivated fields. Imported weeds that threaten natural ecosystems and/or rangeland over wide geographic areas are designated invasive exotic plant species or invasive exotic weeds, and often become the focus of regional or nationwide coordinated eradication efforts. Examples include water hyacinth (Eichhornia crassipes) and purple loosestrife (Lythrum salicaria) in wetlands; Canada thistle (Cirsium arvense), musk thistle (Carduus nutans), spotted knapweed (Centaurea maculosa), and St. Johnswort (Hypericum perforatum) in rangeland; and autumn olive (Elaegnus umbellata) and tree-of-heaven (Ailanthus altissimus) in eastern deciduous woodlands. Classical biological control—the introduction of herbivorous insects or microbial pathogens that are natural enemies of these weeds in their native lands—has been used with considerable success to combat some invasive exotic weeds. Arrival of a new invasive exotic weed on an organic farm is one instance that may justify efforts to eradicate the new arrival. Early detection—combined with an understanding of the ecology of the weed—is vital for successful elimination of the invader. High tolerance to stresses, such as low or excessive levels of certain nutrient elements in the soil; drought, waterlogging, or temperature extremes; or repeated grazing, mowing, or tillage. Exotic plant species that possess a number of these adaptive characteristics, especially “wandering perennials” capable of rapid vegetative propagation, often become a region’s most serious agricultural weeds. Few plant species possess all of the above traits, and most weeds display combinations of several traits that equip them to thrive in certain kinds of disturbed habitats. The “weeds of cultivation,” such as pigweeds, lambsquarters, foxtails, and crabgrass, have evolved strategies to compete with annual crops (rapid growth, strong response to soluble nutrients), and maintain their populations through repeated disturbance (rapid maturation, prolific seed set). Weed floras that develop in frequently-tilled fields differ from those that develop in pastures or rangeland, while a no-till row cropping system elicits yet another weed flora. In addition, long-term use of certain herbicides such as atrazine (not an option for organic farmers) has elicited yet another evolutionary response from the weed community: herbicide resistance. Organic vegetable cropping systems often entail frequent rotary tillage and shallow cultivation, and certain annual weeds tend to multiply even when a diverse rotation is practiced. Most of these “weeds of cultivation” are prolific producers of very small seeds (from 0.1 to 2 mg; for comparison, a lettuce seed is about 1 mg) that germinate from near the soil surface. These seeds often germinate in response to light, even a brief flash of light, which serves as a signal that the soil has been tilled or otherwise disturbed, and that competing vegetation has been cleared away. The seeds of many weed species also respond to wide fluctuations in soil temperature or moisture (indicating proximity to an exposed soil surface), a sudden increase in soil aeration (a signal of soil disturbance), or high levels of nitrate N and/or other soluble plant nutrients (which can result from the rapid mineralization that often follows tillage). All of these responses help explain why tillage often leads to a flush of weed emergence. One interesting and useful fact of weed ecology is the importance of light color or light quality for many small weed seeds. Whereas direct sunlight (or even direct moonlight!) stimulates germination, the green light under a dense plant canopy—a signal that the soil is already occupied by other vegetation—can often inhibit germination and induce dormancy (Egley, 1986). A closed crop canopy can thus shut off weed seed germination as well as retard growth of those weeds that do emerge. Farmers who moldboard-plow their fields regularly may encounter a different weed flora from those who rely mainly on the rototiller (Mohler, 2001b). These include large-seeded annual weeds, such as velvetleaf (Abutilon theophrasti) and common cocklebur (Xanthium strumarium), whose seeds can emerge from a couple inches depth and survive in a dormant condition for many years when buried more deeply. Reduced till and no-till cropping systems may elicit an increase in weedy grasses that can emerge from seeds lying on the soil surface, and perennial weeds like nutsedge and bermudagrass that develop from overwintering rhizomes and tubers. Grass seedlings and stout shoots from vegetative propagules can more easily emerge through the surface residues of no-till fields than newly-germinating broadleaf seedlings. Overgrazing of pastures imposes a different set of stresses that elicit a different suite of problem weeds—those adapted to occupying bare or nearly-bare soil that has undergone removal of aboveground vegetation and compaction by livestock, but has not been loosened and aerated by tillage. Many weeds have wide ranges of tolerances to soil conditions including nutrient levels, textures, and pH, and/or considerable tolerance to drought, temperature extremes, waterlogging, or repeated disturbance. These weeds tend to become troublesome to farmers over wide geographic ranges, sometimes around the world. Others are adapted to specific stresses, such as the extreme soil acidity or toxic excesses of trace elements characteristic of mining wastes (these pioneer plants may do more good than harm! ), or frequent flooding, such as barnyard grass (Echinocloa crus-galli), which is a major weed of rice paddies. Knowing what conditions tend to favor a particular weed species, and how that weed functions in relation to the plant community and ecosystem, can help the organic grower identify and change management practices that may be giving that weed an advantage over crops. For example, some weeds such as lambsquarters and velvetleaf respond dramatically to increases in soluble soil nutrient levels (especially N, P, and/or K), and their growth rates continue to rise with nutrient concentrations well beyond the “saturation point” at which growth rates of corn and other heavy-feeding crops level off. In addition, small seeded weeds require and respond to available nutrients immediately after emergence, while larger-seeded crops like corn utilize them somewhat later. Therefore, overfertilizing, or fertilizing too early in the season, can give the weeds a jump on the crop (Mohler, undated slide presentation). Part of understanding weed ecology is knowing the weaknesses of particular weed species, which can become opportunities for more effective control. Because pioneer plant species are adapted to establish in empty niches, many of them do not tolerate competition early in their life cycle. Thus, a vigorous crop that rapidly closes its canopy can shut out many newly-emerging weeds. Galinsoga (Galinsoga spp.) seeds are relatively short-lived and germinate only at or near the soil surface. Burying galinsoga seed a few inches deep for one year kills off most of them. On the other hand, velvetleaf seeds can lie dormant for years in the subsoil, and spring to life when brought closer to the surface. Velvetleaf seeds left on the soil surface after dispersal are prone to decay and consumption by weed seed predators, and are therefore less long-lived than buried velvetleaf seeds. Weeds most commonly retard crop growth by competing directly for resources, including light, space, soil moisture and/or nutrients. Weed-crop competition can be likened to a race, the outcome of which can range from essentially no impact on crop yield (weed growth is minor compared to that of the crop) to complete crop loss (the weeds overwhelm the crop). Factors determining the competitive balance include weed density (numbers of weeds per unit area), density and planting pattern of the crop, growth rates and mature heights of weed and crop plants, and relative times of emergence of weed and crop (Liebman and Gallandt, 1997; Mohler, 2001a; Mohler 2001b). Seedlings of small-seeded annual weeds like pigweed and galinsoga have a higher relative growth rate (how quickly they double in weight or in leaf area) than most crop seedlings. However, because these weed seedlings are so small when they emerge, their absolute growth rate (weight gain or leaf area increase per plant per day) is initially 10 to 100 times slower than seedlings of most crops (Mohler, undated slide presentation). Thus, fast-growing vegetables like winter squash, Irish potato, and sweet potato that rapidly form a closed canopy can outcompete many weed seedlings by appropriating most of the available light. Slower growing vegetables like onions, and especially small-seeded direct-sown crops like carrots and parsnip, are highly susceptible to weed competition. Many small-seeded crops, such as brassicas, lettuce, tomato, and pepper, are started in the greenhouse and transplanted to the field as vigorous “starts,” which gives them a substantial head start on the weeds. 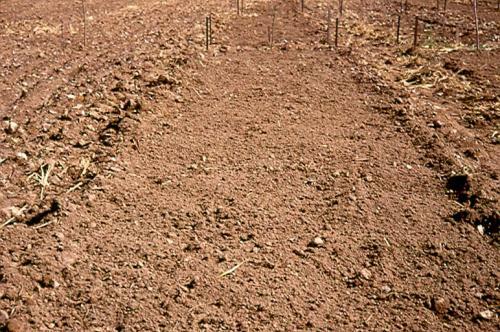 Weeds that emerge before the crop have the most severe impacts on crops, which is why a “clean seedbed” is essential for planting most vegetables. Weeds that emerge with or shortly after the crop can substantially reduce yield unless controlled through cultivation or other means. This competition does not set in immediately after emergence, but at some later point in time (called the “maximum weed-infested period”). If the initial flush of weeds is removed by cultivation before the end of this period, it does not affect crop production. Additional weeds usually emerge after cultivation, and may still affect the crop through competition unless they are removed. However, the later the weeds emerge relative to the crop, the less their impact becomes. At some point (called the “minimum weed-free period”) newly emerging weeds will no longer significantly reduce the yield of the current crop (Fig. 7). For most vegetable crops, this minimum weed free period is the first one-third to one-half of the crop’s growing cycle—about four to six weeks for vigorous summer vegetables like squash, cucumber, snap beans, and transplanted tomato. Figure 7. 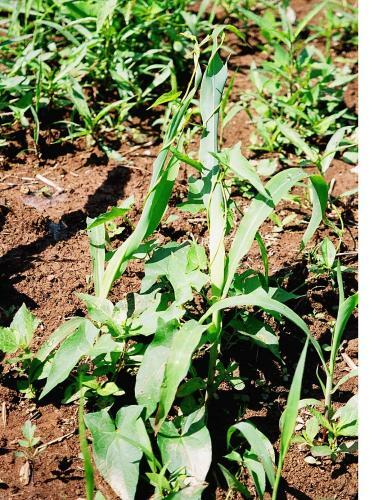 Weeds that emerge with the crop must be removed before the end of Period 1 (maximum weed-infested period) to prevent them from reducing crop yield. The crop must be kept clean throughout Period 2 (the critical period for weed–crop competition). Later emerging weeds (Period 3) have little effect on crop yield. In practice, many vegetable growers endeavor to keep crops weed free throughout Periods 1 + 2, the minimum weed free period, sometimes called the “critical weed-free period." Figure credit: Ed Zaborski, University of Illinois (adapted from Altieri, 1995). The crop–weed interaction is not quite this simple for several reasons. First, the weed flora in most fields is composed of several or many weed species, which compete to different degrees and in different ways with the crop. For instance, tall, fast-growing weeds like velvetleaf and common cocklebur generally compete more severely for light than low-growing species like common purslane (Portulaca oleracea) and common chickweed (Stellaria media). Bermudagrass (Cynodon dactylon) and nutsedges (Cyperus spp. ), although also low-growing, can compete severely for water and nutrients through their extensive root/rhizome systems. Second, weeds affect crops in other ways as well (Fig. 8), such as releasing substances that are toxic to the crop, a phenomenon called allelopathy. Allelopathic interactions can be quite species-specific, and can go both ways (Putnam and Tang, 1986; Rice, 1995). Some weeds, such as nutsedges, crabgrass, Canada thistle, and spotted knapweed are known to release allelochemicals toxic to many crops. On the other hand, some cultivated plants, especially cover crops like winter rye, mustards (Brassica spp. ), forage radish (Raphanus sativus), and sorghum–sudangrass (Sorghum bicolor X sudanense), can suppress many weeds through allelopathy (Haramoto and Gallandt, 2004; Putnam and DeFrank, 1983; Rice, 1995). Most of the active allelochemicals (which can be considered nature’s herbicides) are most toxic to newly-germinating seeds and seedlings. Larger plants, and shoots emerging from rootstocks, rhizomes, tubers, bulbs, or other underground storage and reproductive structures of perennial weeds, are far less susceptible. Third, weeds and crops interact indirectly through their effects on soil microbial communities. One plant species may harbor particular soil bacteria and fungi that either favor or hinder other plants to varying degrees. For example, the majority of crops and some weeds form symbiotic associations with mycorrhizal fungi that greatly benefit the plant by enhancing nutrient and moisture uptake, and protecting against soil-borne diseases. Certain plant families, including the brassica (mustard–cabbage), amaranth (pigweed), buckwheat, chenopod (spinach, beet, lambsquarters), purslane, and sedge families, do not benefit from mycorrhizae ("fungus–root" symbiosis), but are instead somewhat weakened by the fungal infection (Francis and Read, 1995; Vatovec et al., 2005). Thus, a soil rich in mycorrhizal fungi may give grain, legume, allium, and solanaceous crops (all “strong hosts” that benefit from mycorrhizae) a competitive edge over "non-host" weeds like lambsquarters, pigweeds, smartweeds (Polygonum spp., buckwheat family), and nutsedges. One "cutting edge” in organic weed management research is to learn more about specific weed–crop–soil–microbe interactions, including but not limited to these mycorrhizal relationships, and their practical significance in field conditions (Yandoc et al., 2004). Such information can lead to more precise soil management and crop rotation strategies to give crops an edge over particular weed species. Figure 8. Plants give off a variety of natural substances that can directly inhibit or stimulate the growth of other plants (allelopathy) and/or influence microorganisms in their own root zone (rhizosphere), in the bulk soil, or in other plants' rhizospheres. Similarly, soil and root zone microorganisms give off substances that can either support or hinder nutrient uptake and growth of plants. As a result, crops, weeds, and soil life are linked through a web of chemical and microbiological communications that can be quite species-specific. Utilizing these chemical and microbiological interactions to design weed-suppressive crop rotations is a fascinating and potentially fruitful frontier in organic farming research. Figure credit: Mark Schonbeck, Virginia Association for Biological Farming. The fact that weeds cost farmers more than any other major pest category has understandably engendered a “war mentality” about weeds. Given that annual crop production almost inevitably gives rise to a “weed response” from any but the most “dead” soils, a war mentality toward weeds effectively condemns the organic grower to “war without end” in her/his fields. While due vigilance to keep weeds from restricting crop production is essential, organic weed management can be approached as a “dance with nature” in which the farmer works with natural processes to develop better strategies to fulfill the ecological functions of pioneer vegetation. Examples of such strategies can include cover cropping, relay intercropping, and even weedy fallow managed to allow weeds to cover the soil and add organic matter, but not to set seed. Declaring all-out war on weeds with either chemicals or steel can yield clean fields and good harvests—for a time. It can also backfire in the overuse of herbicides and development of herbicide resistance on conventional farms, and in overcultivation and soil degradation on both organic and conventional farms. In addition, agroecologist Miguel Altieri (1993) notes that eliminating all weeds from the farm ecosystem can destroy valuable habitat for natural enemies of insect pests, and thereby increase costs for insect pest control. Stamping out weeds can even contribute to human malnutrition! In developing countries, replacing traditional polycultures that allow some volunteer plant growth with large scale monocultures and near-100% weed control has often undermined food security in rural communities (Altieri, 1993; Altieri, 1995). In addition to curtailing local food production in general, these industrial farming systems eliminate palatable, nutritious weeds like lambsquarters, amaranths, and common purslane from farmers’ fields, and can thus rob low-income communities of an important source of dietary vitamins and minerals. For example, the Tarahumara Indians of the Mexican Sierra depend on edible weeds for food before their traditional crops mature, and especially in the event of crop failure—a clear example of a food system better served by traditional weed management than by modern industrial weed control. Traditional farmers in the lowland tropics of Tabasco, Mexico separate weeds into “good” and “bad” categories based on centuries of observation of their impacts on garden and farm ecosystems, including intensity of competition against crops, effects on soil tilth, harboring of beneficial or pest insects, and their potential use for food or medicine. Farmers in this and many other parts of Mexico have developed management systems that permit moderate populations of the more desirable weed species to grow with their crops, while removing the more harmful species (Altieri, 1995). Invasive exotic plants that threaten natural as well as agricultural ecosystems over a wide region present a special case in which the war mentality may be appropriate. Even so, nontoxic “weapons” such as classical biocontrols imported from the weed’s place of origin, and grazing by sheep and goats that consume some invasive weeds that cattle will not touch, can be utilized effectively. When do Weeds Become a Problem? Figure 9. Weed problems occur when a sufficient weed seed population encounters a favorable environment for weed growth in the presence of a crop that is susceptible to the effects of weed competition. 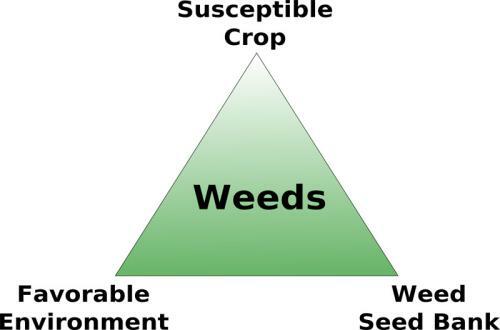 This "weed triangle" is analogous to the crop disease triangle, consisting of a sufficient pathogen inoculum, a favorable environment for the organism's growth, and a disease-susceptible crop. Figure credit: Ed Zaborski, University of Illinois (adapted from Schonbeck and McCann, 2007). Enhance crop competitiveness and tolerance to weed pressure. Remove or curtail weed growth in the critical early stages of crop development. Reduce the weed seed bank in the soil. 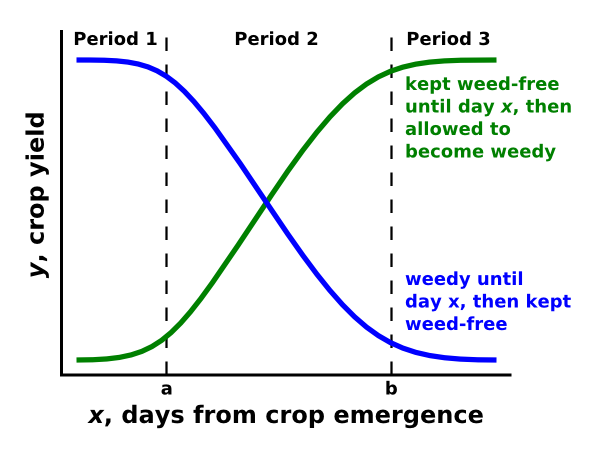 The severity of weed competition against crops is related to weed population density (numbers per unit area), timing of weed emergence relative to the crop, and proportion of resources (light, water, nutrients) consumed by the weeds. Therefore, ecological weed management aims to reduce weed density, delay weed emergence relative to the crop, limit production and dispersal of weed seed and other propagules, and maximize utilization of available resources by crops (Liebman and Gallandt, 1997). Weed management strategies that are based on an understanding of the ecology of agricultural weeds, particularly the major weed species present on the farm at hand, are most likely to yield the best results and to reduce the need for cultivation or herbicides. Such an ecological approach is essential for successful certified organic vegetable production, in which the use of most herbicides is not allowed, and measures to protect and improve soil quality are required. This article is part of a series on Twelve Steps Toward Ecological Weed Management in Organic Vegetables. For more on an ecological approach to weed management, see Integrated Pest Management Concepts for Weeds in Organic Systems. Altieri, M. 1993. Crop protection strategies for subsistence farmers. Westview Press, Boulder, CO.
Clark, A. 2007. Managing cover crops profitably. 3rd ed. Sustainable Agriculture Network Handbook Series Book 2. National Agricultural Laboratory, Beltsville, MD. (Available online at: http://www.sare.org/Learning-Center/Books/Managing-Cover-Crops-Profitably-3rd-Edition) (verified 10 March 2010). Egley, G. H. 1986. Stimulation of weed seed germination in soil. Reviews of Weed Science 2: 67–89. Francis, R., and D. J. Read. 1995. Mutualism and antagonism in the mycorrhizal symbiosis, with special reference to impacts on plant community structure. Canadian Journal of Botany 73 Suppl: S1301–S1309. Holm, L. G., D. L. Plunknett, J. V. Pancho, and J. P. Herberger. 1991. The world’s worst weeds: Distribution and biology. Krier Pulbishing Co., Malabar, FL. Haramoto, E. R., and E. R. Gallandt. 2004. Brassica cover cropping for weed management: A review. Renewable Agriculture and Food Systems 19: 187–198. (Available online at: http://dx.doi.org/10.1079/RAF200490) (verified 23 March 2010). Liebman, M., C. L. Mohler, and C. P. Staver. 2001. Ecological management of agricultural weeds. Cambridge University Press, New York. Liebman, M., and E. R. Gallandt. 1997. Many little hammers: Ecological approaches for management of crop–weed interactions. p. 291–343. In L. E. Jackson (ed.) Ecology in agriculture. Academic Press, San Diego, CA. Mohler, C. L. 2001a. Weed life history: Identifying vulnerabilities. p. 40–98. In M. Liebman et al. Ecological management of agricultural weeds. Cambridge University Press, New York. Mohler, C. L. 2001b. Mechanical management of weeds. p. 139–209. In M. Liebman et al. Ecological management of agricultural weeds. Cambridge University Press, New York. Mohler, C. L. Undated. Ecology of weed management in organic systems [Online slide presentation]. Available at: http://weedecology.css.cornell.edu/pubs/Mohler%20Ecology%20of%20weed%20manag%20Presentation.pdf (verified 4 April 2011). Mollison, B. 1988. Permaculture: A designer's manual. Tagari Publications, Tralgum, NSW, Australia. Putnam, A. R. and J. DeFrank. 1983. Use of phytotoxic plant residues for selective weed control. Crop Protection 2: 173–181. (Available online at: http://dx.doi.org/10.1016/0261-2194(83)90042-X) (verified 23 March 2010). Putnam, A. R. and C. Tang (ed.) 1986. The science of allelopathy. John Wiley & Sons, New York. Rice, E. L. 1995. Biological control of weeds and plant diseases: Advances in applied allelopathy. University of Oklahoma Press, Norman, OK.
Sullivan, P. 2003. Principles of sustainable weed management for croplands [Online]. ATTRA Publication #PO39. National Sustainable Agriculture Information Service. Available at: http://www.attra.org/attra-pub/weed.html (verified 11 March 2010). Schonbeck, M. 2006. Evaluation of frost-killed cover crop mulches for organic no-till production of spring vegetables on small farms. A final report to the Organic Farming Research Foundation on research conducted between July 2004 and June 2006. Schonbeck, M., and B. McCann. 2007. Cultural practices for managing weeds [Interactive Online Course]. Module D. In Integrated pest management for organic crops. Cooperative Extension Curriculum Project. Available via: http://www.sare.org/Learning-Center/Courses-and-Curricula/Southern-SARE-s-Integrated-Pest-Management-for-Organic-Crops-Course (verified 11 March 2010). Vatovec, C., N. Jordan, and S. Huerd. 2005. Responsiveness of certain agronomic weed species to arbuscular mycorrhizal fungi. Renewable Agriculture and Food Systems 20: 181–189. (Available online at:http://dx.doi.org/10.1079/RAF2005115) (verified 23 March 2010). Yandoc C. B., E. N. Rosskopf, and C. T. Bull. 2004. Weed management in organic production systems. p. 213–254. In R. T. Lartey and A. J. Caesar (ed.) Emerging concepts in plant health management. Research Signpost, Kerala, India.